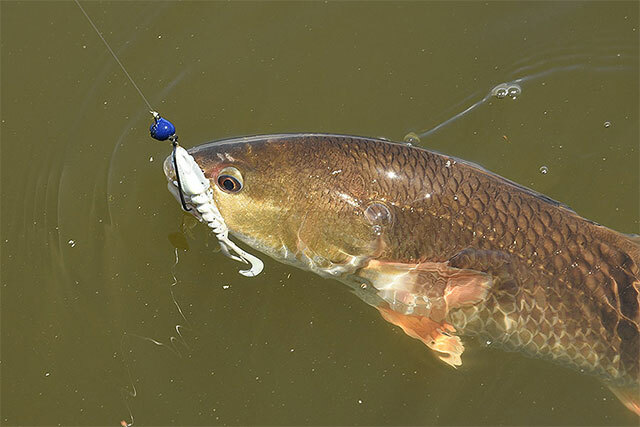 As a reporter for professional bass fishing tours across the country, I am always on the lookout for new lures on the bass circuits that might make good candidates for coastal inshore fishing crossovers. When I see certain lures gaining momentum as proven fish catchers among the best bass anglers in the nation, I try to secure a few for my own coastal experimentation. Several years ago, while covering bass tournaments in Arkansas and Oklahoma, I began to hear about a new kind of jig, referred to as a “swinghead” or a “wobblehead.” This new style of bottom-bumping swim jig was deadly for covering rocky flats on Ozark lakes to catch largemouth, smallmouth and spotted bass. Well-known professional bass angler Tommy Biffle, of Wagoner, Okla., is credited with designing one of the first versions of this unique jig. Biffle called his rendition the Hardhead Jig and teamed it with his namesake Biffle Bug plastic. If you are an avid bass angler, chances are you have probably heard about, and probably use, the Biffle Hardhead. The Hardhead is a very simple, but an ingenious concept that borrows from a traditional football head jig. But whereas a standard football head jig has the hook molded permanently in the lead, the Hardhead instead allows the hook to swing free. In essence, the lead head and the hook are merely linked – or jointed – so the head and hook can move independently of each other. As a result, the hook swings free and the chosen plastic wobbles behind it, hence, the various other names like the swinghead jig or wobblehead jig. No matter what they are called, they are excellent jig choices for saltwater fishing for a couple of reasons. 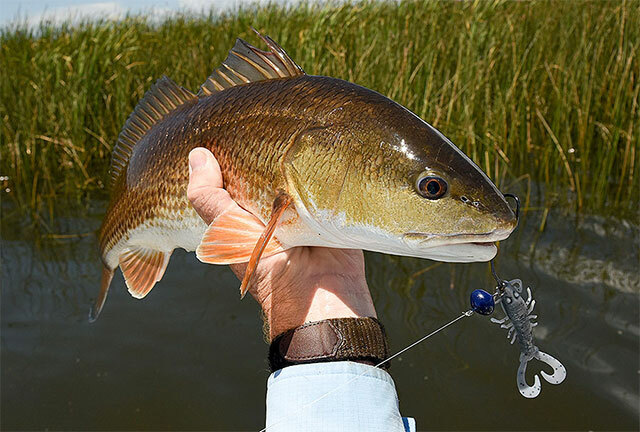 One, the hook is an offset hook, allowing the angler to rig a soft creature bait so that it is weedless – a huge benefit in shallow, weedy bays or around oysterbars. Also, there’s no bulky skirt used with the Hardhead, making the castability of this lure in wind exceptional, which is always a bonus in coastal areas. Since Biffle’s original Hardhead, dozens of variations have followed. Now many tackle companies make some version of a swinghead jig and dozens of homemade swingheads have proliferated throughout the market as well. Over the years I’ve smuggled many of these “wobblers” from Arkansas and Oklahoma back to the Gulf of Mexico where I’ve experimented with them in coastal waters. And I must say, they are absolutely awesome on bay-bound redfish and flounder. The first ones I owned featured the offset hook and they worked okay. My only problem with the offset hook is I’m a big fan of Berkley Gulp in saltwater. When it comes to rigging Gulp weedless, I prefer a screw-lock-type hook over an offset. With Gulp, I just seemed to have a better hook up ratio with screw-lock hooks. When Strike King came out with their Tour Grade Swinging football head, which allowed the angler to attach it to any hook, I started teaming the Strike King head with a Gamakatsu Spring Lock hook. I found that a 3/8-ounce Swinging Football Head teamed with a 3/0 or 4/0 Spring Lock was perfect. Since then, I have found homemade versions of swingheads teamed with spring-lock hooks sold in various tackle shops throughout the Ozarks and I have stocked up on them. As for the Gulp shape, the 3-inch and 4-inch shrimp was a swinghead standard for me for a long time. But when Berkley came out with the Mantis Shrimp, it quickly became my favorite. The Mantis Shrimp has swimming appendages, which really shine on a swinghead. 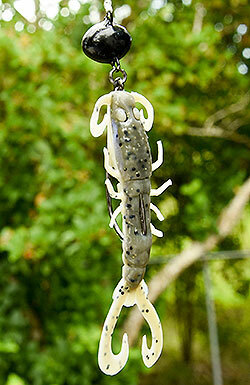 Most bass anglers use some kind of swimming craw or creature bait with a swinghead in freshwater. The Mantis Shrimp provides the same swimming action, plus the Gulp Alive scent is irresistible to redfish and flounder. I fish the swinghead in the salt on heavier casting gear than I would a Chatterbait or a spinnerbait, mainly because the swinghead does require a bit more of a deliberate hook set to drive the hook home. I like some version of a medium-heavy power 7-foot, 6-inch flipping stick with about 20-pound-test braid. In off-color water or around oyster bars I’ll tie directly to the braid. If the water is clearer or I think the fish are line shy, I’ll go to a 17- or 20-pound fluorocarbon leader. When fishing the swinghead, here are a few things that truly make it great. For starters, it is a weedless, snagfree lure that can be fished around anything and everything: emergent grasses like cordgrass, submergent grass such as eelgrass, oysterbars, docks, bridges, rip rap, seawalls, etc. Secondly, since it has no skirt, it casts extremely well. And for that matter, it pitches extremely well, too. The more I use a swinghead, the more I realize how universal it is. Cast it, pitch it, drag it, swim it, pause it, hop it, pop it – fish wherever and however you want and let the Gulp scent do the work. The swinghead bite is kind of unique as well; reds will viciously “tong” it and run at you so fast, you can hardly catch up to them, which is why I like the extra swing in a flipping stick. With flounder, the line will just suddenly get tight and you will detect just a small amount of movement on the other end, like a Senko bite in bass fishing, then it’s game on with a solid hook set. If you’re looking for an alternative to standard open-hook jigheads in saltwater, consider the swinghead jig for more weedless versatility.